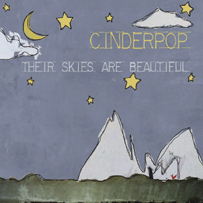 Orchestral vocal pop best described as The Left Banke meet The Zombies (Odyssey & Oracle); Cinderpop offer their second album, Their Skies Are Beautiful, a seductive and addictive melodic tour de force. Based in Vancouver, Cinderpop have been haunting the indie pop scene on the west coast since their first album, Violet Gamma Rays, charted across alternative and college radio throughout Canada and the US. A video for the song "Sniper" appeared on Much Music and a spotlight on Much West helped make their presence known as one of Canada's more inventive rock acts. Cinderpop boast an eclectic round up of musicians from various backgrounds who have found the right mutual influences to create a singular eclectic vision. Kevan Ellis, vocals, guitar (SK Robot); Mark Jowett, guitar, cello (Moev), Joel Myers, bass (Holly McNarland, Texture); Digger Watkins, drums (A Murder of Crows, Twitch), and newest member Erin Jane, keyboards (Salteens). Special guest Rob Calder from The Salteens contributes trumpet. The album was recorded and mixed by Mark Jowett (best known as one of the architects of the early Nettwerk sound). Mastering was by Greg Reely (Delerium, Sarah McLachlan). "Dreamy melodies, pulsing guitars, and Kevan Ellis' free-floating vocals... Delicately picked guitar lines and sonorous vocal harmonies offset each other to great effect..."
"...Cinderpop is aptly named as ... underneath the apparent sweetness there is muscle." "Cinderpop has a relaxed indie rock style that is reminiscent of cool excellent earlier material by Death Cab For Cutie.. The Shins... and Wheat." "...loaded with songs that might have been hits during that all-too-brief post-Nirvana moment when all things indie looked poised to spill over into the mainstream."